Palutena emerges from a door that disappears afterward. Palutena is the goddess of light and female lead of the Kid Icarus series. She serves as the damsel in distress in the original games, but takes on a more proactive role in Masahiro Sakurai's Kid Icarus: Uprising, providing protagonist Pit with guidance and powers from afar. In contrast to her serene, elegant appearance, Palutena has a playful "trickster" personality that she uses to tease Pit and other characters on occasion. In Super Smash Bros. Brawl, Palutena is featured in Pit's Final Smash, Palutena's Army. Pit calls her forth to assist him in battle, to which she then appears as a giant (not her actual size, but her chosen manifestation for this appearance). She will then summon an army of Centurions to attack Pit's opponents, who attack by dive bombing at incredible speeds. 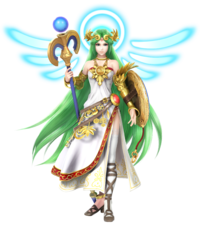 Palutena is also a supporting character in the Subspace Emissary. After witnessing the Subspace Bomb's effects, Palutena sends Pit to the World of Trophies to help stop the Subspace Army. Before he departs, she gives Pit her bow. 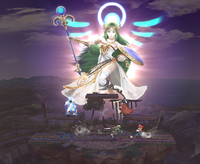 In Super Smash Bros. for Nintendo 3DS and Super Smash Bros. for Wii U, Palutena appears as a playable fighter and newcomer. 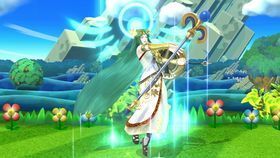 Unlike most other fighters, though like the Mii Fighters, Palutena's custom special moves are not variations of the default moves but rather entirely different moves, and all of them are available from the start. All of Palutena's custom moves are based on the Powers that appear in Kid Icarus: Uprising. Her standard special moves are Autoreticle, Explosive Flame, and Heavenly Light. Her side specials are Reflect Barrier, Angelic Missile, and Super Speed. Palutena's down special moves are Counter, Lightweight, and Celestial Firework, and her up specials are Warp, Jump Glide, and Rocket Jump. Finally, her Final Smash is the Black Hole Laser, a combination of the Black Hole and Mega Laser powers. A statue of Palutena also appears in her temple. Pit can also contact her to talk about all of the fighters with her guidance during the match at her temple in the Wii U version. Palutena returns in Super Smash Bros. Ultimate, this time as an unlockable playable fighter. In this game, she has a set attack for each special move; her down special functions as both Counter and Reflect Barrier, while Explosive Flame appears as her side special. Generally, Palutena has been improved since the previous installment, having more speed and power in her attacks, while her mobility is increased. Palutena's forward and down smash attacks are both nicknamed Goddess Wings, while her down aerial's nickname is Purging Kick. 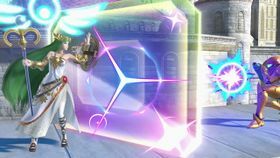 Autoreticle is Palutena's default standard special move in Super Smash Bros. for Nintendo 3DS / Wii U, and her set standard special move in Super Smash Bros. Ultimate. A reticle appears around an opponent within a certain range in front of Palutena, specified by a glowing effect when the attack is initiated, followed by Palutena firing three blasts from her staff at them. The reticle does not follow the target, staying at the same position that the enemy was at when the move was initiated. 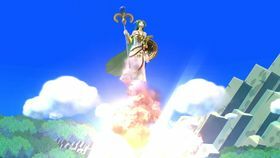 Explosive Flame is Palutena's second standard special move appearing in Super Smash Bros. for Nintendo 3DS / Wii U, and her set side special move in Super Smash Bros. Ultimate. Palutena creates an explosion a set distance in front of herself, dealing multiple hits to any opponents caught in it. 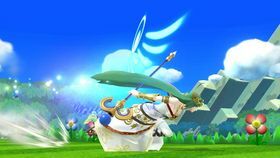 Heavenly Light is Palutena's third standard special move in Super Smash Bros. for Nintendo 3DS / Wii U. 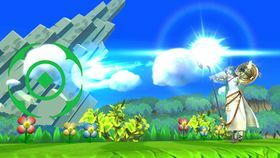 The move creates a field of light that surrounds an area around Palutena, having the largest range of any attack in the series to date. The light deals continuous damage, but the move does not make opponents flinch. The effect lasts longer if the player holds down the special attack button; it can last up to three seconds. 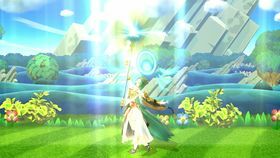 Heavenly Light also appears as both a power that can be equipped and given as a random event in the Smash Run mode in Super Smash Bros. for Nintendo 3DS, having largely the same effect as Palutena's move. Reflect Barrier is Palutena's default side special move in Super Smash Bros. for Nintendo 3DS / Wii U, and part of her down special move in Super Smash Bros. Ultimate. 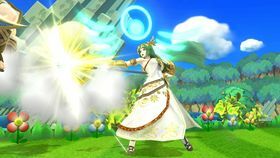 Palutena raises her shield, which causes a magic barrier to appear in front of her and move forward a short distance, pushing away any opponents on the opposite side and reflecting any projectiles that hit it. Palutena's raising her shield also damages nearby opponents. The barrier does not follow Palutena's vertical position, remaining at the same position where she was when it was used. Like all reflectors in this game, dealing enough damage to the barrier shatters it, though the move can be immediately reused. In Super Smash Bros. Ultimate, Palutena executes Reflect Barrier when her down special move is used on a projectile. 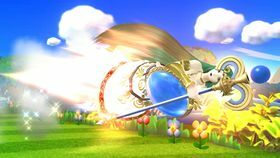 Angelic Missile is Palutena's second side special move in Super Smash Bros. for Nintendo 3DS / Wii U. Palutena launches herself across the screen headfirst, battering any opponents in her path, and it can also be used for horizontal recoveries. Unlike with Pikachu's Skull Bash and Luigi's Green Missile, however, this move cannot be charged, and as such, it can only travel a set distance if uninterrupted. Super Speed is Palutena's third side special move in Super Smash Bros. for Nintendo 3DS / Wii U. 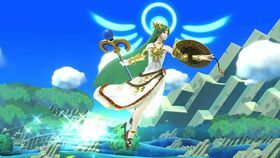 The move causes Palutena to dash across the stage in a sudden burst of speed, stopping when she reaches a ledge and battering any opponents in her way. The move can be canceled by making another input, though if Palutena jumps she retains the momentum gained. The move also has a cooldown time after ending or being canceled. Warp is Palutena's default up special move in Super Smash Bros. for Nintendo 3DS / Wii U. 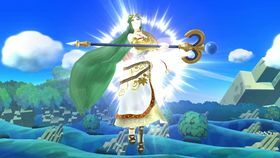 Similar to Mewtwo's Teleport, Palutena vanishes and immediately reappears a set distance away, in the direction being held on the control stick. The move deals no damage to opponents. Jump Glide is Palutena's second up special move in Super Smash Bros. for Nintendo 3DS / Wii U. Palutena leaps into the air and glides down slowly over a period of time, during which the player can control her horizontal movement. Attacking or pressing down on the control stick automatically ends the move. Rocket Jump is Palutena's third up special move in Super Smash Bros. for Nintendo 3DS / Wii U. When used, Palutena creates an explosion that launches herself into the air and damages nearby opponents. If used above an opponent, the explosion meteor smashes them. Counter is Palutena's default down special move in Super Smash Bros. for Nintendo 3DS / Wii U, and part of her down special move in Super Smash Bros. Ultimate. It is based on the power seen in Kid Icarus: Uprising. Like other counter moves, Palutena braces herself for an attack, and when hit, strikes back with her staff, dealing 1.3 times the amount of damage of the attack (dealing a set 10% at minimum). Palutena's Counter deals less knockback than most other counter moves, however, but it can potentially make 1-hit KOs if Palutena blocks any attacks that deal 40% damage or more. In Super Smash Bros. Ultimate, Palutena executes Counter when her down special move is used on a close-up attack. Lightweight is Palutena's second down special move in Super Smash Bros. for Nintendo 3DS / Wii U. Palutena glows for a brief moment, and has increased overall movement speed and jump height, but she takes more damage for the duration of the effect. In addition, once the boost period has ended, Palutena's speed and jump height are decreased from normal for a brief time, and after that there is a cooldown period before she can use the move again. 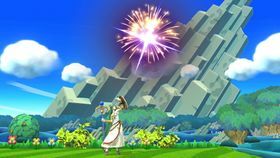 Celestial Firework is Palutena's third down special move in Super Smash Bros. for Nintendo 3DS / Wii U. Palutena launches a firework into the air that explodes soon after, the firework (while harmless in the original game) sending opponents into the air and the explosion dealing multiple hits. Black Hole Laser is Palutena's Final Smash in Super Smash Bros. for Nintendo 3DS / Wii U. When used, Palutena jumps off the battlefield and generates a Black Hole to draw in any nearby fighters and trap them, then fires a Mega Laser to deal repeated damage to those trapped and any other opponents in its path. The laser angles itself downward as it travels across the screen depending on the direction Palutena was facing when using the attack, though the angle has no effect on the damage output. 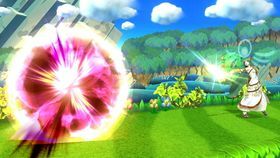 Unlike most other trapping Final Smashes, the Black Hole does not need to trap an opponent for the Final Smash to continue. At the end of the attack, the Mega Laser launches the trapped opponents and Palutena returns to the battlefield. Palutena appears in Super Mario Maker as a costume available for Costume Mario. Her sprite is based upon her appearance in Kid Icarus: Uprising, rather than the one seen in the original Kid Icarus. All of her sound effects, including the transformation, jumping, and fanfare, are taken from the Famicom Disk System version of the original Kid Icarus. Pressing causes her to stand facing the player. NES Kid Icarus The ruling goddess of Angel Land. Palutena showered the earth with rays of light, using her powers for the good of mankind. But Medusa, who in her hate for mankind was banished to the underworld, makes war on Palutena and wins, capturing and holding the goddess deep within a temple. Palutena entrusts Pit with a sacred bow and the task of defeating Medusa. 3DS Kid Icarus: Uprising (03/2012) NA: In Kid Icarus: Uprising, the goddess of light uses telepathy to communicate and grants miracles to support Pit on his adventure. In Smash Bros., she has special moves like Warp and Heavenly Light at her disposal. She's very adaptable - you can customize her into a long- or close-range fighter! EU: Said to be able to perform miracles, this goddess supports Pit in battle, using telepathy to communicate with him. She's no slouch on her own, either. She has a huge variety of moves you can customise and use to your advantage. Short or long range, the sky's the limit! Or maybe not. After all, she can teleport. (3DS) N/A NA: Palutena's Reflect Barrier side special deflects any attacks and projectiles that come at her from the front. Unlike other reflective moves, you can leave this barrier in place and it will keep reflecting. If you really want to ruin someone's day, you can push them over an edge using this move. EU: Palutena's Reflect Barrier special deflects any attacks and projectiles that come at her from the front. Unlike other fighters' reflective moves, you can deploy this barrier and then leave it to its own devices. You can also push opponents with it, so use it on someone who's teetering on the edge of the stage to push them off. 3DS Kid Icarus: Uprising (03/2012) NA: Palutena's Reflect Barrier side special deflects any attacks and projectiles that come at her from the front. Unlike others' reflective moves, she can move a bit while this barrier is active. If you really want to ruin someone's day, you can push him or her over an edge using this move. N/A NA: Palutena's Final Smash. After doing a divine twirl, she creates a black hole in front of her, drawing in her opponents.When she's got 'em where she wants 'em, she follows up with a wide laser beam that reaches from one edge of the screen to the other. It even changes direction slightly, just in case someone managed to avoid the black hole. Pit: Wait a minute! Lady Palutena, you're fighting me? Palutena: Don't sound so dismayed. Think of it more as a sporting event and less as...a massacre. Viridi: That's awfully presumptuous of you, Pit! Pit: Please! I know better than anyone else what Lady Palutena's capable of. After all, I fought her once before. Palutena: Good luck, Pit. You're gonna need it. Of course, I won't be giving you any hints during this battle. And no powers or centurions, either! Palutena talking about Shulk in her guidance. French (NOA) Paluténa Palutena; acute accent added for pronunciation purposes. 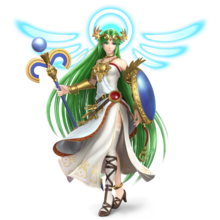 Palutena's newcomer artwork is the only one not to feature any Mario characters; it only features herself, Pit, Dark Pit, and Link. Consequently, her artwork is the one that features the second-fewest number of characters. Palutena is the only character in the Subspace Emissary who is neither playable nor an enemy/boss. Palutena makes a cameo in Cloud Strife's All-Star ending, where she is walking towards a blaze while Cloud glares at her. This was a reference to the Nibelheim Incident from Final Fantasy VII where the main antagonist Sephiroth proceeded to raze Nibelheim, Cloud's hometown, to the ground. Owing to the reference, Palutena's hair was colored gray in this instance rather than her trademark green. This page was last edited on April 25, 2019, at 14:05.